“I'm so ready to put my feet up! Thank you for giving me a place to do so with my kids…we are happy to be here at The Rum Runner House again!” -- A returning Phillips Academy parent from afar. Rum Runner House is a family-oriented property close to Phillips Academy, Brooks School, Pike School and Merrimack College. The home makes it possible to spend quality time with your student and his/her friends during your visit in a very comfortable & flexible manner. 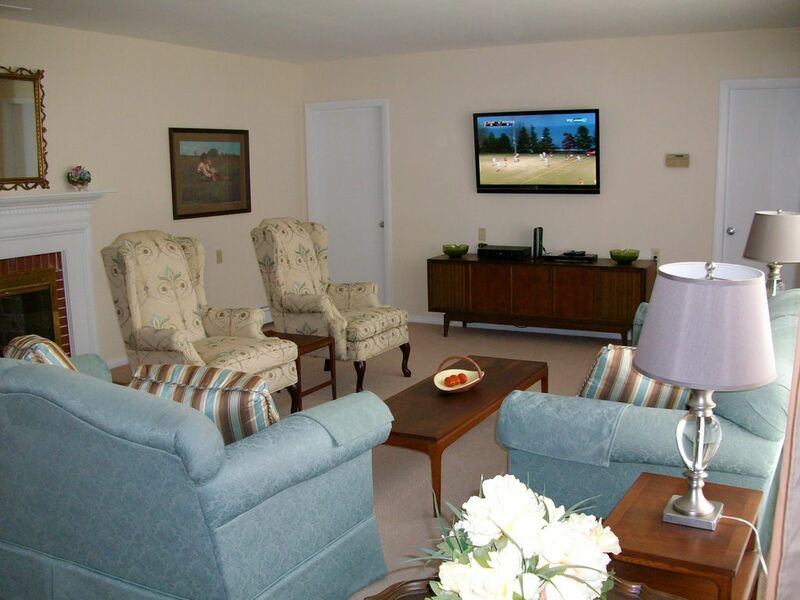 Well-stocked with HDTV, classic books & board games to suit a range of tastes, on-site recreational choices also include table tennis, basketball, street hockey, driveway soccer, bocce and Frisbee, baseball & football toss. Enjoy getting to know your child's friends over a ping pong game, or by sharing nicely grilled steaks out on the fenced-in, brick patio. Have the freedom to spoil them by cooking up favorite family recipes that brings the group as close to your home kitchen as is possible. With the large amount of space, you can arrange with the Academy to welcome your student and friends to spend the night off-campus in 'your home away from home' -- a treat that is especially treasured by students who are themselves a long way from their own families. In addition, The Rum Runner House has become a favorite venue of corporate managers looking for an excellent extended stay property for their valued employees. Such guests have included the New England headquarters of a Presidential campaign, financial executives and performance artisans. The property has remained in the same family's hands since its purchase in 1947. The experience of sending its youth to far-away schools created an awareness of how the residence could provide a wonderful 'home away from home' for familes from around the USA -- and the globe -- entrusting their childrens' education to nearby New England private schools. Located in sight of the Memorial Bell Tower at Phillips Academy -- the ground on which colonial troops mustered prior to engagement in the American Revolutionary War -- the property is named after the B-24 Liberator heavy bomber in which its original resident earned the Distinguished Flying Cross prior to returning home from Europe and building the home in 1947. Nestled in the shade of three massive old trees on the property, this large home has served for decades as a perfect venue for gathering family with longstanding, and brand new, friends. Its one level design makes it inviting for even the very young and seniors. Combined with the potential to provide your boarding student with the ability to experience the day student lifestyle on their campus for a short period, Rum Runner House offers your entire family memories that will be treasured for a lifetime. Collection of pilates tapes in Fireplace Room. The Game Room includes Zumba Dance video games on XBox 360 with Kinect that provide a fine workout for dancercize fans. The double oven is helpful for family events. Sizeable collection of classic texts, history and general interest titles. Smaller group of youth titles. The property is a large New England Ranch House, characterized by all of the rooms being on a single level. This makes it perfect for families traveling with elderly relatives -- for example, to visit their child & grandchild attending Phillips Academy (please see www.pspaandover.org), Brooks School, Pike School or Merrimack College -- and reduces risk should the elders prefer to enjoy home while the younger family members take an aggressive approach to pursuing day trips to tour venues throughout New England. For families touring Prep Schools, the following distances (# miles) apply: Andover (1), Brooks (7), Governors (17), Landmark (20), Middlesex (24), Concord (25), Lawrence (28), Groton (30), Milton (31), Exeter (32), Hillside (42), St Mark’s (44), Tilton (68), Brewster (79), Tabor (81), New Hampton (82), Pomfret (84), NMH (90), St George’s (91), Eaglebrook (92), Deerfield (92), Holderness (92), KUA (109), Cardigan (114), Loomis (116), Westminster (126) and Choate (140). Steve and his party were some of the best hosts I've ever incurred through a vacation rental. They were there to welcome us at check-in to give us the keys and the grand tour of the Rum Runner House. As well, they were very flexible with us as we arrived later than expected. It's a very spacious house with all the amenities. We felt like we were in our own home! Large property as described in many glowing reviews on this website. Owner is a good host. House is well equipped and very clean. Our weekend at the Rum Runner house was awesome! It is a long house so the sleeping area is very separate from the rest of the house. It was very homey and and clean and had all the necessary items (kitchen ware, towels, bedding, etc). Snacks were left for us when we arrived. We were in town for my daughter's wedding and the two families were able to get to know each other in a home atmosphere. Steve (the owner) was great to work throughout the process. We are so thankful we had the opportunity to stay there; it made the wedding weekend perfect! Wonderful hosts, excellent location, good choice for a casual crowd. The layout of the home keeps awake and busy people away from the quiet or sleeping- which we liked very much. Our hosts were responsive, flexible and accommodating which made our visit easy and pleasant; I'm hoping to stay again! Great indoor and outdoor space, well stocked, and comfortable for large group. Lots of space inside and out; kitchen has everything you need for cooking and serving a crowd; great fenced backyard with patio set for 8 people; easy access to I-93 for day trips to Boston. The property is well-located near two interstate highways that provide easy access to every charm offered by the New England region. New Hampshire is minutes away, with choice spots in Maine, Vermont, Western Mass, Cape Cod, Rhode Island and Connecticut largely accessible in less than two hours. Additionally, the Boston-bound train station is only two miles away, while the Boston-bound bus stop is in walking distance (1/3 mile). The drive to Downtown Boston runs between 25-90 minutes. The residence sits upon a spacious one-acre lot in an attractive neighborhood, which is generally flat and readily-accessible. The manager is a located only a few miles away, affording ready-access when service is needed -- yet complete privacy for guests. Property is located one mile from Phillips Andover Academy's Memorial Bell Tower. The Academy's nationally respected Addison Gallery of American Art and The Robert S. Peabody Museum of Archaeology are easily accessible. Also, the Academy's 65 acre Cochran Wildlife Sanctuary offers several miles of gently rolling trails through woodlands with beautiful ponds for hiking and X-country skiing. Rates are subject to change until a Rental Agreement is executed. Guests are to provide their home address, home and mobile phone numbers to be included in the Rental Agreement. Fifty percent of the Rental Fees are due within four business days of the agreement with the remaining Rental Fees, Cleaning Fee and Security Deposit due sixty days before occupancy.